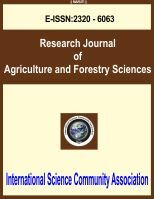 International Science Community Association are publishing an international peer reviewed journal Research Journal of Agriculture and Forestry Sciences. It is the vision of International Science Community Association to publish research papers, research articles, review papers, mini review, case study and short commutations in all areas of human study without financial restriction. Coverage Area: Researches in the field of Agriculture and Forestry Sciences which including agriculture development and policy, agriculture engineering and sciences, horticulture, genetic and plant breeding, genetic resources, agronomy, irrigation, ecology systems and environment, soil and fertilization, soil and cultivation, plant biochemistry, plant biotechnology, plant protection and seed technology, crop science, plant protection, natural ecosystems, stored products research, food security and safety, hydrology, water resources management, rural development and biodiversity and forestry sciences, etc.